Various breeds of SCP-621 in the Site 16 greenhouse at night. Special Containment Procedures: All instances of SCP-621 are to be kept in the Site 16 greenhouse and watered regularly. Seeds and pollen from SCP-621 are not to be released into the wild. No instances of SCP-621 are to be released for commercial trade, given as gifts, used as props, used as bribes, or stored in personnel offices. Personnel are advised to not look at SCP-621 for extended periods of time. Addendum 621-3: Personnel are advised not to look at SCP-621 through sunglasses, which has recently been shown to increase SCP-621's mental effects. Only unfiltered lab goggles may be worn around SCP-621. It should be of additional note that unfiltered lab goggles, lab glass, or other transparent obstructions will not shield SCP-621's effects. Any instances of SCP-621 found in the wild are to be exterminated immediately. Any instances of SCP-621 found in public are to be confiscated and whoever in possession at the time be taken in for questioning. Civilians actively watering SCP-621 in the wild are to be detained and the instances of SCP-621 to be confiscated. Be warned that some may use physical force in order to protect SCP-621. Cross-pollination of SCP-621 species will require clearance from Command-level Personnel. No cross-pollinations may be done for personal reasons. Description: SCP-621 is a series of highly invasive flowering plants, originally released by ██████ & █████ Flower Shop, that have been in the Foundation's possession as of █/██/0█. 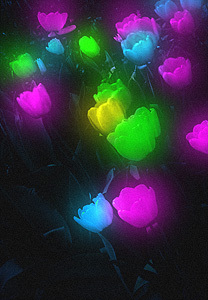 These plants, mainly the plant species Didier’s tulips (Tulipa gesneriana), are naturally bio-luminescent, powered by water and other nutrients. These plants glow a variety of colors, though most instances glow purple, blue, or green. This bio-luminescent effect can be best seen at night or in a dark area. The effect is only active while the plants are alive. SCP-621, particularly its glow, seems to have a hypnotizing effect on humans, with numerous requests by personnel to store them in their personal offices, all of which have been denied. SCP-621 has varying effects on other animals. When exposed to bees, hummingbirds, or cross-pollinating animals, all of the animals subjected have preferred spreading the pollen of SCP-621 as opposed to other flowering plants, and due to its bio-luminescence, are capable of doing this at night, increasing its rate of reproduction. However, when exposed to herbivores, such as deer or rabbits, all of subjected animals have actively avoided SCP-621. With a high fertility rate, a natural defense against predators, and a hypnotizing effect on humans, SCP-621 can be deemed a highly effective invasive species. Addendum 621-4: Upon further testing, SCP-621's pollen gives off a strong and pleasant aroma. SCP-621 is completely hypoallergenic, and when personnel with allergies are exposed to up to five (5.0) grams of SCP-621's pollen, personnel displayed no allergic reactions. When placed around other plants, SCP-621 aggressively absorbs nutrients that would normally be absorbed by the other plants, potentially to fuel its bio-luminescence. As a result, SCP-621 quickly drains the soil of nutrients and requires more water than all other plants in the Site 16 greenhouse. Before being actively monitored by the Foundation, SCP-621 had invaded multiple farming pastures, but because of its hypnotic qualities, nothing had been done to stop them. In addition, sympathizers actively watered the invading plants during their incursions. Although government agencies such as the USDA and EPA protect against these sorts of invasive species, said agencies have actively defended SCP-621 at the expense of commercial farmers. It may be of note that these farmers have since accepted the situation, citing SCP-621's aesthetic superiority to their own crops and their desire to protect SCP-621. The Foundation stepped in when SCP-621 began invading ███████████ National Wildlife Preserve, threatening several instances of both endangered plants and animals. The EPA refused to hinder the spread of SCP-621, despite the existential risk to plants and animals, on the grounds that it would have made the ███████████ National Wildlife Preserve more aesthetically pleasing. Although Didier’s tulips (Tulipa gesneriana) are the most common type of SCP-621, there also exist species of SCP-621 that include other types of tulips, roses (Rosa spp. ), and a few instances of lettuce (Lactuca spp.) as a result of cross-pollination. However, no D-Class personnel could bring themselves to eat SCP-621, worried about possible side-effects. When force-fed, SCP-621 induces intense anxiety and paranoia on the subject, but no other side-effects. This anxiety dissipates upon digestion. This effect has been seen on multiple test subjects. Addendum 621-1: In light of the recent events involving Dr. Z████████ hoarding several instances of SCP-621 in his personal office, all personnel on Site 16 are allowed to keep at least one instance of SCP-621 in their offices. Addendum 621-2: In light of Dr. Z████████’s public apology for hoarding several instances of SCP-621 in his personal office, personnel are no longer allowed to keep any instances of SCP-621 in their offices.